If using the oven, preheat to 400F. If using wooden skewers for roasting the kebabs in the oven, soak them in water while preparing the ingredients. Use metal skewers if you plan on grilling. Dice the loin filet into 1 inch cubes. Try to keep the cubes small and consistent in size, so they cook quickly. Combine all the diced vegetables (bell peppers through mushrooms) in a large bowl and toss them with olive oil, salt and pepper. 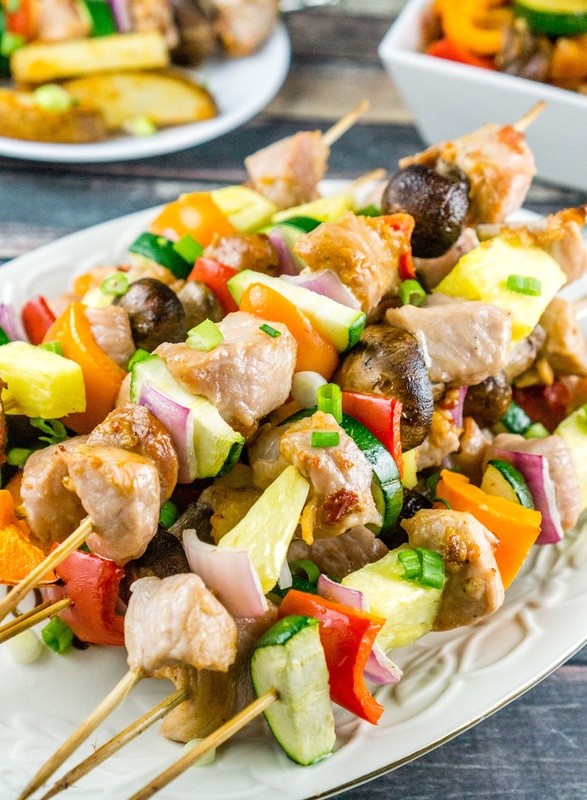 Assemble the kebabs by alternating between the diced pork, various vegetables, and pineapple pieces. Roast or grill the kebabs for about 15-20 minutes, or until the pork is fully cooked to an internal temperature of 170F. Remove from heat, allow to cool 5 minutes before serving, and garnish with diced scallions.